New York Boutiques 2 (Part of the Boutiques family of Growable buildings) is a High Wealth Commercial Services Building that grows on all densities of Commercial zones. This building is part of the group of generic High-Wealth stores grouped under the Botiques name. Chalmers Co. uses the same model sets and can be considered a Commercial Offices variant of this building. This building is likely based on the Main Entrance of the Graybar Building in New York City, New York, with fictional sides and rear. 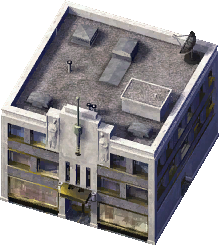 From this building's Exemplar Name, it can be assumed that this building was originally only meant to grow when the Chicago tileset was active. This page was last modified on 15 May 2014, at 12:30.